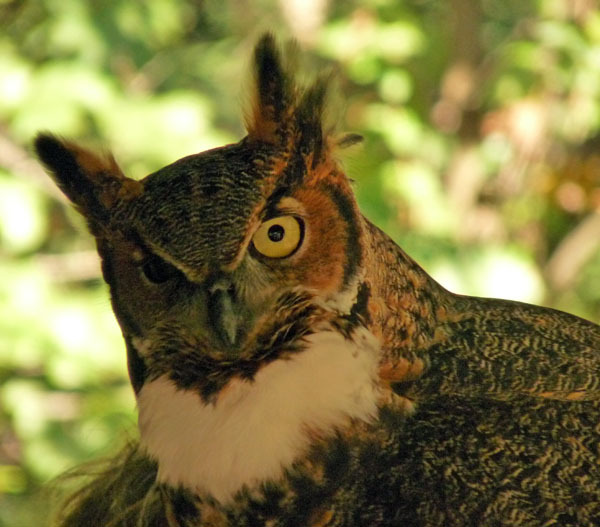 Great Horned Owls - Raptor Rehabilitation of Kentucky, Inc. The Great Horned Owl is the largest of the tufted owls and, in overall size, is second only to the Snowy Owl. The plumicorns (or ear tufts) are only feathers and have nothing to do with hearing. Their function is to show expression, like our eyebrows. Ear tufts allow them to look larger and more threatening when showing aggression. They also serve to lengthen the owl when it sits against the trunk of a tree so that it blends in and resembles a bulge on the tree. The eyes of a Great Horned Owl are the same size as a human's, however, the GHO has a small skull. If a human being had eyes in its head to compare with Great Horned's , our eyes would be the size of grapefruits and weight five pounds each! They are barrel shaped and go deep in the their head, occupying about 50% of the skull. A Great Horned Owl can see to hunt by the light of one birthday candle 3 football fields away, yet they also see well during the day. They are reported to be able to see birds flying overhead during the day that people cannot see with the aid of binoculars. The talons of the GHO are the most feared of all the raptors. Each of their feet is capable of exerting 500 pounds of pressure per square inch, which would be enough to crush a human skull, if their feet were able to go around it. The GHO kills its prey with these talons, simultaneously puncturing the animal with razor sharp talons and crushing the animal with its grip. Their legs are also equipped with a locking mechanism that prevents them from releasing their prey until the legs straighten. 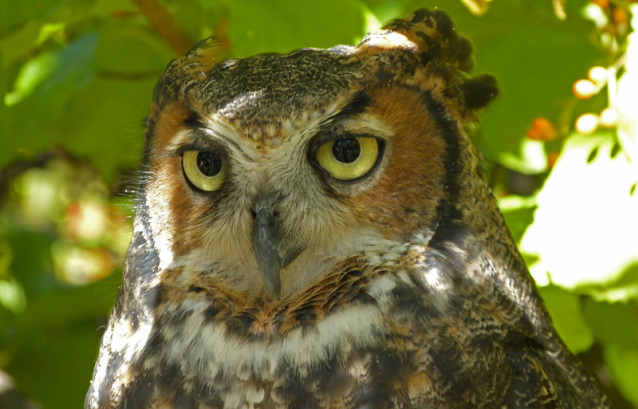 What does a Great Horned Owl eat? Anything that walks, swims, slithers or flies can be a meal for the Great Horned Owl, including skunks, rabbits, woodchucks, dogs and cats. They can take birds as large as geese and herons. The GHO can carry off up to 3 times its own body weight. A female GHO usually weighs between 4 and 5 pounds, so she could fly off with a 15 pound dog easily. They can be found throughout the Western Hemisphere, from the Arctic to the Straits of Magellan. Owls are terrible nest builders in general. Because GHO's are extremely aggressive, they often steal a nest, driving off Red-Tails and even Bald Eagles. Or they may nest in natural cavities or in the crook of a tree. In Kentucky, they breed in December and have eggs in the nest by January. Since they are the first to have young in the nest, GHO chicks have an advantage over other young raptors because they have more time to practice hunting. The chick's eyes open around day 10, they are "branchers" at 5-6 weeks of age, and are proficient fliers by 9-10 weeks of age. Luna is named after the goddess of the moon, but RROKI volunteers think it's really short for lunatic. She came to RROKI as a young chick in March, 1995, with an obvious eye injury. She was examined by a pediatric ophthalmologist and it was determined that she has a detached retina and detached optic nerve in her right eye. Wild adult GHO's are very difficult to "man down." Luna was imprinted on humans deliberately, in the hopes of making her more suitable to use as an education bird, yet she is still the most aggressive bird we have. Wild owls hoot during courtship season in October and November. Luna hoots 24/7, every day of the year. Wild owls often come to visit our center to see what's going on. She is our public relations owl, since everyone in a school can hear her hooting when we come for a program. Birdu was found in March 1984, as a 10 day old chick, making him the oldest bird we have. His original owner's niece noticed his droppings and called him "Bird-Doo." Birdu fell out of his nest as a tiny chick, and was returned to the nest by a local rehabber. Three days later, the tree fell over in a storm. His sibling was killed and Birdu's wing was crushed beyond repair. He was subsequently hand-raised and imprinted because of his injuries and non-releaseability. During mating season, he tries to court any human entering his cage. In fall of 1999, his original caretaker passed away unexpectedly, and he was transferred to RROKI. Hagatha hatched in February, 1994, and came to us as a 5 month old chick. A farmer in Marengo, IN, found her on the ground in a heavy snow when she was just a downy chick. He thought she was blind because of her cloudy eyes, and raised her in a chicken coop feeding her natural foods. As her eyes naturally cleared, he realized she was not blind and released her. In a few weeks, however, she came back, so he fed her up and released her again. After her third return over a period of a couple months, he decided to keep her as a pet. His granddaughter had seen a Raptor Rehab program and knew this was illegal, so she was brought to us. Due to her aggressive nature, we tried to teach her to hunt, and released her again in April 1995 at a weight of 4 lbs and 14 ozs. Within a month, we received a call from a lady living 4 or 5 miles from the release site. She had a sick owl in her yard and feared it would be hit by a car. Upon close examination (finding jess marks and 2 broken tail feathers) we identified the bird as Hag. She had lost approximately 50% of her body weight, proving that she is incapable of caring for herself in the wild. Hagatha is an education bird and an excellent surrogate mother. She teaches all the chicks in her care to be big mean Great Horned Owls, and we've never had any trouble releasing them into the wild.